"Clinic to Farm to PATIENT"— for homeless and uninsured suffering from diet related health issues. For the patients of the SAY and HUDA clinics, vegetable orders written by their physician can be filled at the "Big Glen" garden from 9-11 AM on Wednesdays and Thursdays. "Big Glen" and Isla’s Garden are located on Glendale Ave, between Hamilton Ave and Third Ave, across the street from the SAY clinic and the DRMM. Almost an acre of hope for the surrounding community. The vegetables we provide may change depending on the season, but we work with local grocers to supplement those missing foods, through grants and donations. Check in with us at the garden or visit one of the clinics to learn more! Note, the clinics serve the homeless and uninsured community, and care there is FREE. Buckets of Rain's garden "Big Glen" in relation to the HUDA and SAY clinics. Buckets of Rain's vegetable distribution day is open to all those in the neighborhood, and we’d like to announce that it has a new location in 2018. BoR formed a partnership with the Wayne Metro Community Action Agency, and they will be heading up our vegetable distribution day as well as connecting residents of Wayne County with a variety of services they provide. Visit our friends at their hoop house on 3rd ave, between Highland and Cortland, on Fridays from 10-12 to see what produce is available! 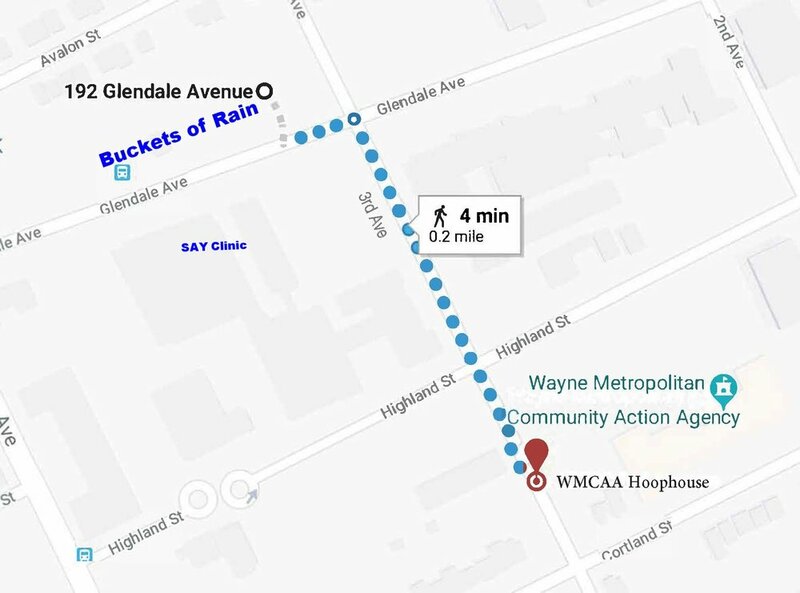 Directions to the WMCAA Hoop house from Buckets of Rain's "Big Glen" garden.